Cheetahs are large cats that are designed for speed. Habitat: Cheetahs are found in sub-Saharan Africa. They are rarely observed in southern Algeria and northern Niger. Their distribution range is from Senegal east to Somalia and south to northern South Africa. 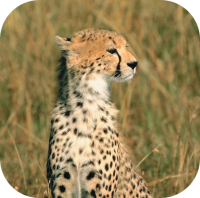 Cheetahs are found in the savanna, open grassland or dense woodlands. Size: Male cheetahs are larger than their female counterparts. Cheetahs stand 2-3 feet high at their shoulder. They measure 3.6 to 4.4 feet in length with a tail that is tail is 26 to 33 inches long and finally cheetahs weigh 86 to 143 lbs. 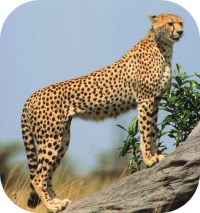 Diet: Cheetahs prey on small antelopes like Thomson's gazelles and impalas. 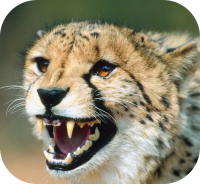 Cheetahs will also eat small mammals and birds. 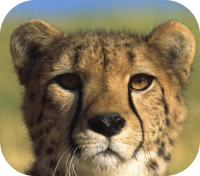 Senses: Cheetahs have excellent vision and a good sense of smell. Description: Cheetahs are designed for speed, they have long, slim legs, a small, round head, a flexible spine, a deep chest, and a long tail. 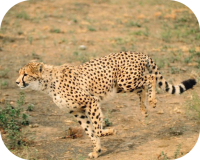 The tail is used to balance the cheetah when running. Cheetahs have claws that are not retractable and pads on their paws to provide additional traction. Cheetahs have solid spots, unlike the rosette spots on a leopard. Cheetahs have unique distinctive black tear streaks that run from the down beside their nose to their mouth. The black striping is also designed with the "hunt" in mind. The coloring helps them spot prey in the distance. 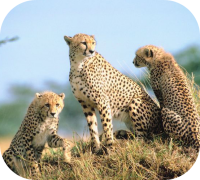 Birth: Cheetahs cubs have a high mortality rate. It is estimated that 50 to 75% of cheetah cubs die before 3 months. Cheetahs give birth to litters of 2-4 cubs. 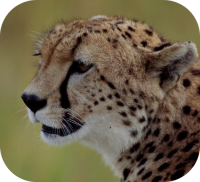 The Cheetah is the world�s fastest land mammal. The cheetah can go from 0 to 60 mph in only three seconds. Cheetahs can reach top speeds of 70 and 75 mph. Gestation: Cheetahs carry their young for 3 months. Cubs: Cheetah cubs are born completely helpless and it takes a few weeks for them to open their eyes. The cubs weigh 9 - 15 ounces at birth. Sexual Maturity: Females reach sexual maturity between the ages of 20 to 24 months. 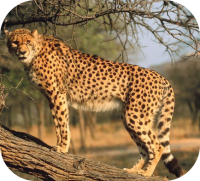 Life Span: Cheetahs live up to 12 years in the wild, and cheetahs can live up to 17 years in captivity. 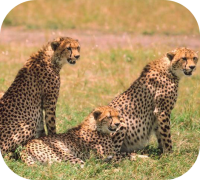 Social Structure: Cheetahs live in alone or in small groups. Males may group together for life. These small groups are called coalitions. Males will mark their territory by urinating on trees, logs, and termite mounds. Athleticism: Cheetahs are extremely athletic. Cheetahs hunt during the day, and they ambush their prey. Cheetahs have large nostrils that allow for an increased intake of oxygen, and their oversized heart and lungs help power their bodies. 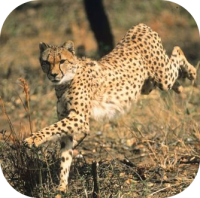 Cheetahs can run exceptionally fast for short durations. Population Status: There are approximately 12,400 cheetahs left in 25 countries.